We decided to compile all of our videos in one place. 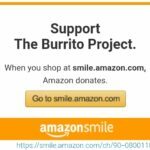 We hope this makes it easier to learn about The Burrito Project and for you to easily spread the message. January 21, 2016 – Pamela Calore and 3 students from the Art Institute of California San Diego visit The Burrito Project to document the day with us. Here’s a compilation of the 4 videos listed above.